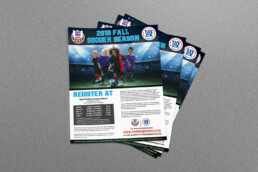 We regularly get asked to help regions with custom marketing materials, one of the big items is registration flyers. Since each area and region has their own demographic, and want to put their own spin on things, we cant typically use templates. This one was unique in that they wanted to be able to edit the text. The solution I came up was to design the flyer in Photoshop, then save a copy without the text to use a background in word. From there I added the text back in and sent it out the door.